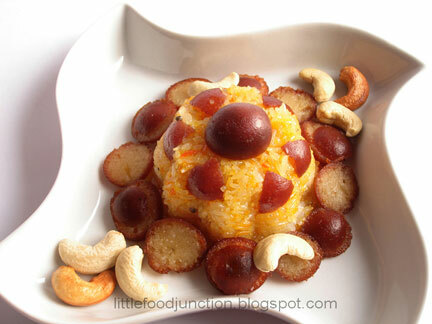 Smita Gyan Srivastava is blogger behind food art blog, Little Food Junction. She has Master’s degree in design. She worked for ad agencies before opting to be a stay at home mom when her newborn daughter. Currently, she lives in New Delhi with her husband and a lovable daughter. Apart from styling cute food, she loves to paint, click and read. [Food-india] What's your cooking and art philosophy? How do you see both of them (blend them) together? [Smita] I always believe that food is a beautiful creation and cooking is surely an art. Food should satisfy your eyes as much as your palate. Just as an artist adds lovely colors to brighten up his creations a good cook adds a wonderful combination of ingredients n spices to make an edible masterpiece for our taste buds. A true delicacy is a wonderful combination of aroma, flavor, color and appearance. A properly garnished and presented dish is surely more inviting. [Food-india] How did you get started blogging about food art? [Smita] My edible creations were loved by all neighborhood kids and they always wanted me to help their moms with their Birthday menus. The teachers at my daughter's school were so impressed with her tiffins that they invited me for a guest demo at a PTM. This was the time when my hubby motivated me to blog about my edible creations so little Food Junction started. My blog is all about food shaped like things other than food. 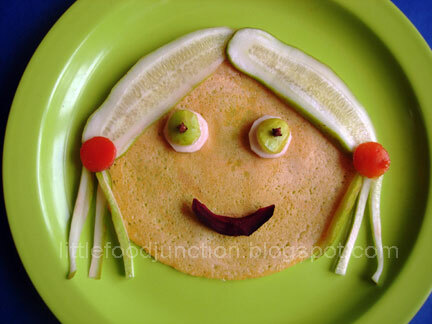 [Smita] Little Food Junction is all about making our little ones healthy and happy. It’s just an effort to end the Great Meal Wars at the dining tables (with kids)! Schools are working hard to teach kids about healthy and nutritious food but they won't alone be successful unless we parents don't get involved. 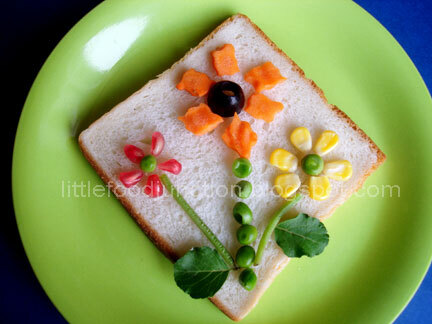 Anyone visiting my blog should say "I can make this too...."
[Food-india] How did you learn art of food art? [Smita] I inherited this art from my mom. I have grown up seeing her making beautiful salads n packing simple lunches wonderfully. Painting was always my passion but motherhood metamorphosed the canvas to meal plates and platters. [Smita] Since all bloggers put in such a lot of love and effort to their blogs, selecting a few would not be justified. Learning is an unending process and each of the blogs in the cyber world teaches something new. [Smita] My favorite Indian meal to cook and to eat is the humble Moong Dal Chilla or the savory Uttapam topped with lots of chopped onions and tomatoes. But while entertaining i greatly rely on the versatile paneer. I love to relish the truly mouth watering Golgappas but i still have to work hard to make all puff up right !! [Food-india] Any quick tip on decorating food? 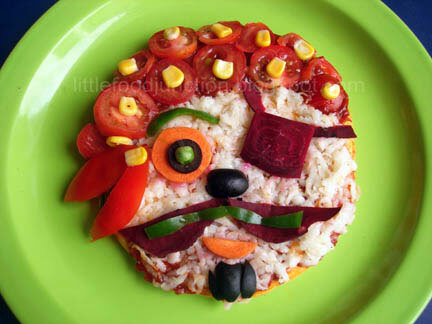 [Smita] Color plays a major role in decorating food so use a variety of colorful veggies while serving food to the kids. Visual perception, surely, goes a long way with the little ones. [Smita] Color coordination and proper lighting are the two most important features for a good food picture. Soft day light works wonders for amateur shots. Results from simplest cameras can also be fantastic if these two features are kept in mind. Surely a sturdy tripod is a good investment to minimize all those blurs n low light issues. [Food-india] Is there anything else you'd like to add? [Smita] There is an old Chinese proverb – “Tell me & I will Forget, Show me & I will Remember, Involve me & I will Understand”. 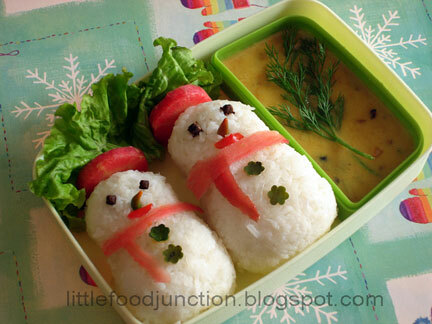 So try involving your kids once awhile in the kitchen (may be while making cute foods for them). It will definitely take double the time but would surely make them aware of healthy food choices.